Eggnog evokes fond childhood Christmas memories for me. I love it with or without the alcohol, hot or cold. 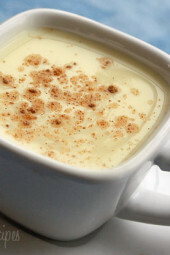 This low fat eggnog recipe is rich and creamy. Using vanilla beans is really worth the added expense so don’t skimp here. This is easy to make and so much better than store bought eggnog so if you’ve never made eggnog before, give this a try. You can make this a few days ahead. Use your leftovers for Eggnog French Toast, Eggnog Souffles, or Eggnog Lattes. Yum! Heat 2-1/2 cups milk in a medium saucepan. Split the vanilla bean lengthwise and scrape out the seeds; add the seeds and pod to the saucepan and simmer over medium heat. In a large bowl, whisk the eggs, sugar and cornstarch until it turns light yellow. Temper the eggs by gradually pouring the hot milk mixture, about 1 cup at a time, into the egg mixture, whisking constantly (this is important, otherwise you’ll make scrambled eggs). Place over medium heat and stir constantly with a wooden spoon until the eggnog begins to thicken, about 6-7 minutes. Remove from the heat and immediately stir in the remaining 1/2 cup milk to stop the cooking. Remove the vanilla pod, let it cool and transfer to a pitcher, chill until ready to serve. Spike the eggnog with liquor, if desired (extra points), and garnish with nutmeg. Thank you for always sharing such flavorful food friendly recipes. My questions is what is the smart points value per serving? I just made this eggnog recipe. Mine never thickened up at all, and I whipped it 8 minutes on the stove. Haven’t tried it yet tho. It’s still cooling. I’ve since tried it, and it’s pretty good. Would have been nice if it tasted a bit creamier, but still not bad. Since Weight Watchers now does Smart Points, how many smart points do you count for this recipe? Possible to use Stevia to cut the sugar? To those who used vanilla extract….how much? I'm new to this whole healthier cooking and weight watchers bit. 🙂 Thanks!! I have the same question! How much vanilla extract?? Thanks! Oh man. Turns out tempering eggs is harder than it looks! What I have now is definitely not eggnog, but it's still delicious! c) required stuff I couldnt find here in SA. Until I found your recipe!!!! OMGOSH its wonderful! I made 2 batches for Christmas for my family and I, and again 2 batches for New Years. I left it unspiked as many different tastes in my family. Some liked it plain, with nutmeg, without, and I liked mine with Southern Comfort. However, I did bring it down to 3/4cup sugar for the first batch and then 1/2cup for the second (mixing the two batches together at the end), as the original sugar qty was far too sweet for me (I wonder what the new points would be for that?). So, thanks so much!!! I cant wait to make this at the end of this year at Christmas for my in-laws who are in another city. I'm sure it'll be a hit there too, and I know it's now a Holiday Season tradition for me now! Oh I just re-read the recipe and see it's 1/3 sugar hahahahaahah!!!! no wonder it was so sweet!! I used 1 cup AND 1/3 the first time!! HAHAHA!! Oh dear, I dont want to know the points for that hahah! To make this an adult beverage do u think adding vanilla vodka would be too much vanilla? I would think so, if you were unsure, cut out the vanilla pod/extract and just use vanilla vodka, but I dont think it'll matter either way 🙂 Try Southern Comfort too (personal preference here:P)….DELISH!! This was so good! Mine came out a little to thick to my taste (I may have overcooked it a tad) so I added a little more milk (and some rum! )and it turned out fantastic. This reallt does taste like the real thing without all the guilt! I ended making a "lighter" eggnog bread pudding with your eggnog recipe and it came out wonderful! Thank you Gina for all your amazing recipes, I recommend your blog left and right! Wow. You have saved my healthy holiday season! I made this tonight, and even my kids loved it. I used regular vanilla extract because vanilla bean is not something I usually have in my kitchen, and I had to make this NOW :). I added pumpkin pie spice at the end for a little zing. Thanks for this recipe! The recipe has suggestions for using leftovers of this. I would have to make a lot extra just to have leftovers – I just want to drink it. Very good and low fat! I agree with others who say this tastes more like pudding/custard. It is still delicious! If you want eggnog, however, you may have to make/buy the real thing. This was amazing. I actually made it with Trader Joe's Unsweetened Vanilla Almond milk (2 1/3 c) and some fat-free half and half (2/3 c). It came out great and the points stayed the same. I love eggnog and since starting WW I've had to cut back. Now I don't have to! Thanks Gina!!! Thanks for that info, Oren. I was wondering about the Almond milk. It seems like that would be perfect for eggnog. This was so yummy. I shared some with my dad and grandpa yesterday, my dad said it was way better than the stuff they bought at the store this week. I used a teaspoon of double strength pure vanilla extract instead of vanilla beans. I am planning to use some of the leftovers in a muffin mix I found last year. Thank you again for all your hard work. May I know if this eggnog can be made a week or two ahead of Christmas? I live in Malaysia And am making this for the first time! Would like to make it for an American couple living here, who does not take alcohol.can I add vanilla extract and rum extract as well? So glad I stumbled onto your blog. Please reply as soon as possible. Thnaks.Blessed Christmas. was wondering if i could use silk soy milk instead? I made the eggnog last night, it was ok when warm. But, after being thoroughly chilled it was fantastic! Could not believe the texture. When it was warm I added some rum extract to give it the flavor I am used to. As a sweetener I used part Splenda and part Blue Agave Syrup and used just a little less. I am going to look for a pretty container to buy to put it in for serving it this weekend! She's one now! I should post a new pic! JUST SAW YOUR BABY POST — CONGRATULATIONS !!! If you get a chance, what would the points plus be for this recipe. I don't want to give up the eggnog!! This looks great! Thank You!! Sure, rum extract would work to give you the taste without the added points. I wonder if you could use rum extract added to it, if you didn't want to sacrifice the points for the real deal? Since it is July, I think I will wait for cooler months to try this. I was just on here browsing and found this. I am excited to try it, since I love eggnog but gave it up for the calories and fat. Sorry I couldn't respond sooner, was having my baby. You can use skim milk, not sure about Lactaid. I don't see why not. Of course, vanilla extract is perfectly fine. Yes, those beans are very expensive!!! I look forward to having a little spiked eggnog tonight now that I am no longer pregnant : ) Happy Holidays!!! I can't wait to try this! My family used to love "drinking custard" when we lived in the South, bought next to the egg nog, but without the artificial "rum" flavoring. Since returning to the north (dragged kicking and screaming…) we have not had the chance to enjoy it. I am gearing up to begin my final diet and was scouting recipes. This one was a Christmas gift! Thank-you. Also, many blessings with your beautiful baby girl! She is perfect! I made this and it was delicious. I couldn't find a vanilla bean (silly small town grocery stores!) but vanilla extract sufficed. My boyfriend (who swears he can taste when things are "healthy") drank all of it before I could make french toast or a latte with it. I may have to venture to the "big city" to find a vanilla bean and make it again so I can try the french toast and latte!! Can I use vanilla extract instead of vanilla bean? Can I use vanilla extract rather than vanilla bean? I am having a hard time finding the vanilla bean, unless I am looking in the wrong place. Also want to take a minute to thank you Gina!! Your recipes are real lifesavers- they are sooooooooo delish!! Do you think I could try this with vanilla extract?? I'm having trouble find a vanilla bean? Also- let me take this moment to thank you Gina!!! Your recipes are real life savers- they are soooooo delish!!!!! I couldn't wait to make this! I was going to buy vanilla beans at the store tonight, but I couldn't bring myself to do it. Yikes, they were expensive! I compromised with pure vanilla extract. 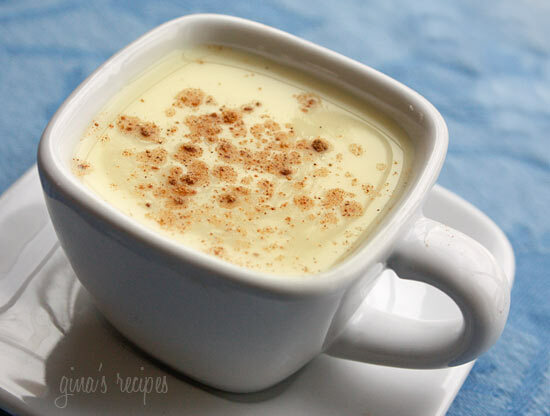 To me, it tasted more like boiled custard than eggnog, but that could very well be because I couldn't wait long enough to let it chill completely and it was still warm when I drank it. One word: YUM!! This is definitely a very tasty substitute for the full-fat version. I can't wait to try the eggnog French toast. To me the flavor of the eggnog was very French-toast-y anyway (again, probably because it was still warm), so I bet the actual French toast is delish! I wanted to thank you, once again, for your fabulous site. I bought a couple of Biggest Loser books when I began my weight-loss journey a couple of weeks ago and every recipe I've tried from their books has been tasteless. I've found nothing in the books that I — or my family — would actually eat. So far I've fixed about a dozen recipes from your site and haven't been disappointed in a single one. You've given me hope that I can modify things that my family and I will actually eat and that I can be successful in losing weight this time because, really, who wants to eat things that don't taste good? Yum. I just may have to make this for the hubs. He loves eggnog, but hates that it is loaded with so much fat. Love it, thanks. I'm a little nervous about the tempering the eggs, I've never done that before, but the low points definitely beg me to try this. Will this work with Lactaid milk? How about skim milk? Also- what's the best type of container to store this in. Wow…this looks so delicious! I'm going to be getting a vanilla bean and some extra milk tonight! Yum! Perfect to go with our cookie baking day tomorrow! Thanks! Numnumnum. I thought you were going to post that God awful pudding packet eggnog recipe. Thanks for not disappointing! Thanks for noticing that. Just 2 eggs. I'll fix that. The instructions mention eggs and an egg yolk, but the ingredients list only lists 2 eggs–should there be an additional egg yolk? or do you just use one whole egg and only the yolk of the other one? My daughter will love me if I make eggnog for her. This sounds great! Thanks. I love this- it sounds great! Sounds yummy! I love eggnog. Will definitely have to try this one.